Thousands of women in Poland have gone on strike in protest against proposals for a total ban on abortions. 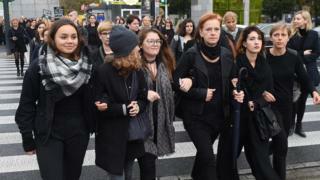 They marched through the streets wearing black as a sign of mourning for their reproductive rights. Women who oppose the ban are staying away from work and school and refusing to do domestic chores, in a protest inspired by a women's strike in Iceland in 1975. Anti-abortion protests are being held around the country too. Women took to the streets of the capital city, Warsaw, in a pro-choice march on what they called "Black Monday". They also protested in Gdansk, Lodz, Wroclaw, Krakow and elsewhere in the mostly Catholic nation. Demonstrations were held in solidarity in other European cities, including Berlin, Brussels, Dusseldorf, Belfast, London and Paris. Will Poland impose a total ban on abortion? If the draft law - which has cleared one parliamentary hurdle so far - goes through it will make Poland's abortion laws as restrictive as those in two other countries in Europe: Malta and the Vatican. Women found to have had abortions would be punished with a five-year prison term. Doctors found to have assisted in an abortion would also be liable for jail time. The draft law came from an anti-abortion citizens' initiative that gathered some 450,000 signatures. It was initially backed by the Catholic Church, but bishops then said they could not support the proposal to jail women who had an abortion. The strike didn't have a huge visible impact in the sense of affecting economic life in Poland. Even in large cities like Warsaw almost all shops were open and companies and offices went about their day-to-day business. What was noticeable was the level of support for the protest. On the streets, trams and buses of Polish cities many women wore black in solidarity with the strike. Thousands of people braved the rain to join a demonstration in Warsaw's historic old town. Some men helped out, cooking soup and serving sandwiches. The French actress Juliette Binoche tweeted her support for the protest during a visit to Krakow. What's apparent is that the vast majority of Poles do not want a more restrictive abortion law. In a recent Ipsos opinion poll, only 11% favoured that option. Almost half said the existing legislation should remain unchanged, while more than a third said abortion should be more widely available. Abortion is already banned in most circumstances in Poland. Critics say the tightening of the law could mean women who have a miscarriage are also investigated, on suspicion of having had the pregnancy terminated deliberately. At early stages of pregnancy, miscarriages and abortions have indistinguishable symptoms. One protester said: "We are saying 'enough is enough' over what is happening, to what the government, the Church and the so-called pro-life organisations are planning for women. "They want to introduce an anti-abortion law which will mean in many cases, women will be sentenced to death. It will take away the sense of security they have, the treatment options available when pregnancy puts their lives or health in danger." One gynaecologist warned that the law as it is worded now could effectively lead to doctors being unwilling to do invasive prenatal tests and lifesaving operations. Prof Romuald Debski, who works at a hospital in Warsaw, told Polish media: "Whoever causes the death of the unborn child is punishable by imprisonment up to three years. If I have a patient with pre-eclampsia, who is 32 weeks pregnant, I will have to let her and her child die. "I have to, because if I perform a caesarean section and the child dies, I may go to prison for three years, because the child was premature." Pre-eclampsia is a potentially fatal condition that can develop in the second half of pregnancy and can only be cured by delivering the baby. A separate bill seeks to curb in-vitro fertilisation (IVF), allowing only one embryo to be fertilised at any one time, and banning the practice of freezing embryos. The Catholic Church is among those who support a total ban. The Polish Bishops' Conference asked Catholics to pray for "the conscience and the light of the Holy Spirit on all Poles who protect human life from conception to natural death". The country's foreign minister was another high-profile critic of the protests. Witold Waszczykowski told Associated Press: "We expect serious debate on questions of life, death and birth. We do not expect happenings, dressing in costumes and creating artificial problems." While pro-choice activists marched in black and tweeted pictures of themselves wearing black, anti-abortion activists chose white for the colour of their counter-protests. Even by conservative estimates there are far more illegal abortions than legal ones in Poland - between 10,000 and 150,000, compared to about 1,000 or 2,000 legal terminations.